Well, more like an opinion poll, really. 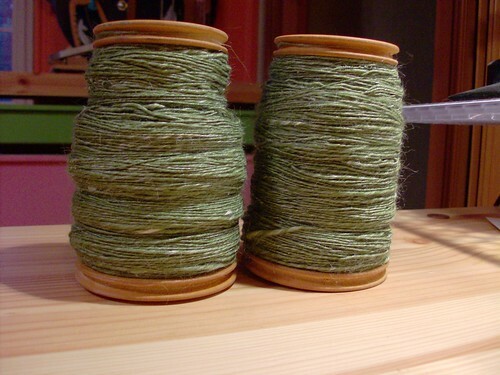 I finished spinning up that merino-silk that you saw a few days ago (erm… ok, more like almost two weeks). So, I have two nicely full bobbins. Left to right, that’s the single, a two-ply, and a three-ply. Obviously, it’s a pretty inexact representation, because it’s from the end of one bobbin, but it should give you an idea. Thoughts? Also, I need an opinion on something else. See, I designed a shawl. And I finished knitting it up about two weeks ago. I don’t have pictures of it yet, but you haven’t seen it here because I’ve been debating whether I should submit it to Knitty (eek! ), or self-publish it. It got a lovely response from the girls up at Large Marge’s when I unveiled it at the book club meeting, and it even won the “True Love” prize (my very own Dread Pirate Roberts action figure. :D). The thing that is making me hesitate about submitting (aside from lack of self-confidence) it is that it’s a pi shawl, and there was just one in the Spring issue. So, I’ll take thoughts on that as well. I will say that if I self-publish, it’s not going to be a free pattern, just FYI. 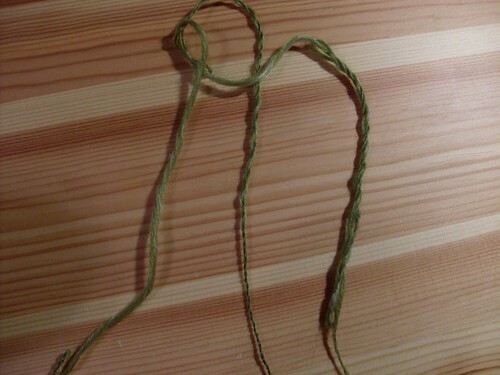 July 5th, 2009 | Tags: Knitting, Spinning | Category: Misc. i like it as a two-ply yarn. so pretty. and the shawl is quite lovely from the preview i saw. I say submit, because it’s a great way to get your pattern out there. Worse case scenario if you don’t make it you could self publish! I like it as a two ply too. And what Miko said re: the shawl. Huh. I’ve got nothing new to say. Submit it. If they don’t want to include it, self-publish! I actually like the chain ply. And I think Miko’s got the right idea about the pattern. Can’t hurt to try. Another vote for two-ply, shawl. It’s gorgeous! I vote for a 2 ply and also for submitting the pattern. If it doesn’t get accepted you can always release it yourself. I want to see this shawl! 2 ply. Submit the pattern. What they said. I love the color on that yarn! Let’s get plying girl! Yes, why not submit it? Maybe try Twist, too. Good luck! I have plenty of opinions but I’m absolutely no help on anything spinning. I’ll leave that to everyone else. As far as submitting, it can’t hurt. You’ll never know if you don’t try. I vote on the 2 ply. Love the color.